Hold on to your sweet tooth. It might just fall out of your head and come running toward the computer screen. Get this... Butter and brown sugar melted in a 9-inch cast iron skillet . Pie crust on top of that. Then apples, more crust, more butter and topped off with cinnamon sugar. Yep. You read that right. Brown sugar and butter under the crust! It bubbles up and makes caramel under the whole thing!!! Can you even?! Di's recipe was so easy. She uses a can of apple pie filling. Of course you are more than welcome to make your own favorite apple pie filling. I considered it. But then I decided why make it more difficult than it has to be? 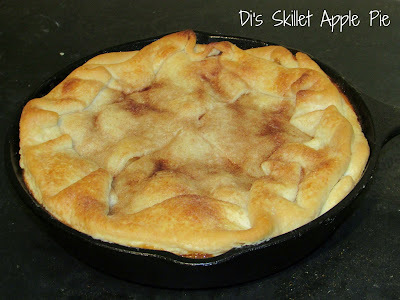 I had a super yummy apple pie in just over a half hour with only one skillet dirty from start to finish. It doesn't get much easier or tastier. Perfect for a weeknight even! Melt butter in 9-inch cast iron skillet . Remove one tablespoon and set aside. Add brown sugar to the pan and mix into butter. Place a pie crust over the brown sugar mixture. Sprinkle with one tablespoon on cinnamon sugar. Spread apple pie filling over pie crust and top with second crust. Fold crust free form over the pie. It is a skillet pie, so it should be rustic and not to fussy. Brush reserved butter over pie crust and sprinkle with remaining cinnamon sugar. I hope you love it! I may have to check our Dollar Tree out and see if they have it too! Double yum! This looks so delicious. Thanks for linking up to Funtastic Friday. Hope to see you again this week. So good and so easy! Thanks for hosting! 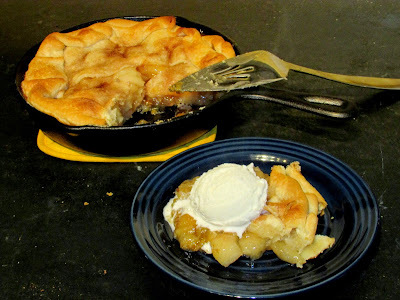 I'm a chocolate kind of girl, but for non-chocolate desserts apple pie wins every time. The way you describe the caramel under the crust...well, I can't resist. I have to admit, I was a little skeptical. But I was glad I went ahead and did it! It was so good! Thanks for hosting! This looks SO GOOD! I have never cooked in a skillet before. I am going to try this. I love my cast iron skillets! They are very versatile and last forever. I hope you enjoy it!